- Intensive Moisturizing Shampoo 8 oz. - Intensive Moisturizing Reconstructor 6 oz. - Weightless Shine Sealer 2 oz. Bring Fried & Dried hair back to life with this rejuvenating haircare system for hair that’s been colored, permanently straightened or feeling weak, brittle or dehydrated. After repeat use, hair is revived and left stronger, shinier and smoother. Rich intensive formulas, power-packed with strengthening proteins, essential botanicals and moisturizing humectants rejuvenate hair, delivering strength, shine and manageability. The Super-Hydrator system is idea for hair that is dry, damaged, colored, bleached, permed, chemically-straightened, or just plain tired from facing the rigors of today's environment! For best results, use the Super-Hydrator Pro Dryer when blow-drying hair. - Supercharged Natural Ion Complex accelerates water deep into the hair for maximum hydration. 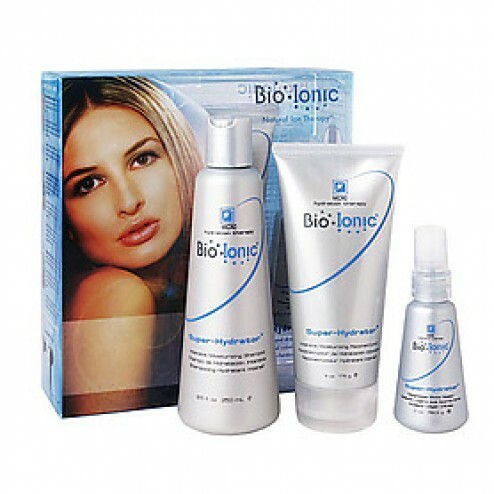 - Rich intensive formulas bathe the hair in rejuvenation.